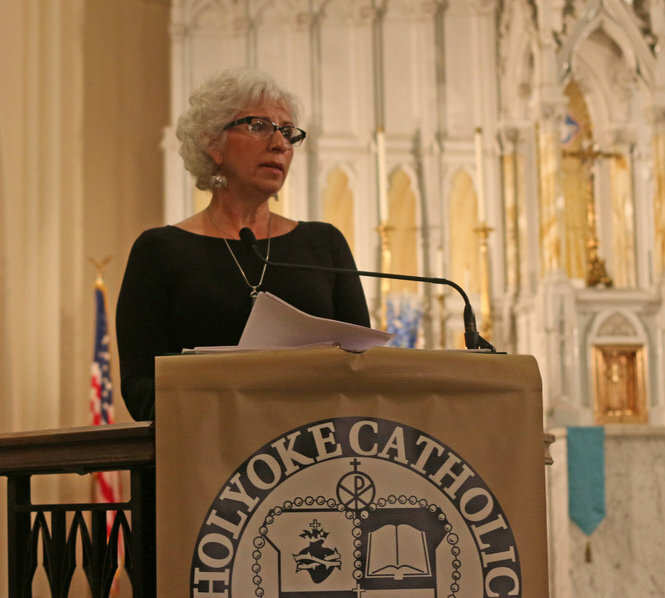 As a 1971 alumna, I was proud and honored to give the commencement address to the Holyoke Catholic High School graduating class of 2015. A bittersweet time since this is the last graduating class because of an upcoming school merger. Good evening graduates and to all who are here in support of your life. Congratulations, as one journey is ending and many more beginning! When I was asked to speak at your graduation I wondered what I could say to add meaning to this day. As I contemplated various topics I knew what I wouldn’t be talking about. I am not going to talk about your goals, or your education, what your plans are for the next year or two or four, or the state of the world. What a remarkable and challenging time this is for you! When I graduated, I took quite a bit with me. To share this story I’m going to backtrack to my freshman year. As I approached the freshman building, right here on the corner of Elm and Hampden St, I looked out over the many heads of other freshmen waiting to be let in on our first day of school. In the crowd I noticed a tall dark haired boy. “Hmm he’s cute,” I thought. There was also an intuitive nudge, the inner voice that said, “Pay attention.” I should have known the universe had a plan. Because of alphabetical order, we ended up in the same homeroom, by Sophomore year we got to be friends, Junior year we started dating, and Senior year a picture of us as a couple was posted at the beginning of our yearbook, and Doug was named best looking. I knew I was right in how cute he was! This October we will be married for 40 years! Back then, we had aspirations and plans, but we did not know how life was going to unfold. Who really does? I had no idea that besides being a nurse, I would become a writer. Doug had no idea he would become president of PeoplesBank. Not knowing what life has in store for us is one of the wonders and great mysteries of our existence. The unknown is where many possibilities and gifts await. I believe we grow a deeper, wiser self from exploring the unknown, from those things that surprise and challenge our minds, bodies, hearts and spirits. Recently, I came into possession of an autograph book that belonged to my mother when she was a teenager. This book held notes and well wishes from friends; much like how we sign high school yearbooks. The difference being that at the age when teenagers begin high school, my mother and father, who were each living in Poland when WWII broke out, were taken as prisoners of war. They were shipped in train box cars to Siberia where they suffered in work camps, and where many people died. After her release, the rest of my mother’s teen years were spent in Africa. As I read through this small hand-tied book, the writings spoke to how she Maria touched and inspired others’ lives. I am sure her heart was lifted by what friends wrote. And, maybe their inscriptions even helped her remember who she was during a time when everything in her world had changed. Knowing and understanding the intricate, multi-layered nature of who we are in this world, matters. This brings me to the message I want to share with you. It is about the most significant relationship that you can explore and nurture. That relationship is with YOU! With YOUR SELF! No matter what you do, how you do it, what you dream, where you live, who you pray to, and who you love, all of these aspects of your life will flow easier and feel more true if you open up to the inside workings of YOU. It is in the depths of self that you will begin to discover, appreciate, accept, and love all of who you are. You may be thinking you know yourself, and I believe many of you probably do know who you are at this point in your life, but trust me, there is going to be much more to you in the future. Imagine your “self” as a landscape. What does it look like? Are you an open field, or a dense forest, is there a stream running through, or are you seeing a desert? Or maybe you are a busy metropolis. These days, we are fortunate to have GPS technology to help us find our way. Envision the GPS map of your inner self. As you experience life, that internal map will expand, gain greater detail, and look pretty amazing as you zoom in on YOU. Every experience you have will offer opportunity to understand more about yourself, your connections to everything around you, your relationships to others, to your inner spirit, and to the Divine. You will be challenged by the best and worst of how you are, and who you are capable of becoming. Believe in yourself. Draw on your strengths and talents – discover your voice, express yourself creatively, be kindhearted, be grateful for your successes, and be able to admit your failures, for in them there are great lessons! In our culture there are pressures to perform, to achieve, to “be” according to others’ criteria. These expectations can detour you off your path. Learn to trust your inner compass. Pay attention to your feelings and your intuition which can surface in a variety of ways – an instinctive knowing, a gut feeling, an inside voice, or like for me “noticing a boy in a crowd.” If you listen to your intuition, and learn its quirks and how to work with it, it will be one of your great guides in life. Our hearts and souls are precious parts of who we are. It is vital to our soulfulness and to our humanness to share in relationships. Though technology and social media have their place, they do not replace a tender touch or hug, the sound of one’s voice, looking deeply into another’s eyes, enjoying the tastes of a shared meal, or together breathing in the scent of a new day. The beauty in this ongoing “getting to know yourself” way of being is that the more you know and understand your “self,” the more you will understand others and attract caring, meaningful, supportive connections and friendships into your life. Change is ahead of you. Change is inevitable. Sometimes we look toward change with joyful anticipation, other times, when the path ahead lacks clarity there is apprehension. How change affects you, and you affect change can be more empowering and hope-filled when you are mindfully engaged, and move forward with positive intentions. We all have our reasons for what we reach for. Whatever your reasons for the path you have chosen to pursue, or in some cases maybe the path has chosen you, embrace your whole self – mind, body, heart and spirit- as you step into your tomorrows. Don’t underestimate the power of your presence in this world. Even the simplest act can have a profound effect on the lives of others. As your story unfolds may it be above and beyond all your expectations! Thank you and again congratulations!